Palm Bay Villas is an 11.7 acre site on Clear Lake in West Palm Beach, Florida. The site has nearly 900 linear feet of waterfront and direct access to the Turquoise Necklace Pedestrian and Bike Trail which connects to the downtown. Florida Atlantic Investments engaged Michael Singer Studio to investigate how to distinguish the Palm Bay Villas site from the many generic housing projects in South Florida by examining the development’s potential from a socioeconomic and environmental point of view. An important goal of the project was to create a visibly unique project that stands out as a model of progressive community design. The Studio’s goal was not only to create a new model, but also to raise the bar on development standards and expectations in South Florida. 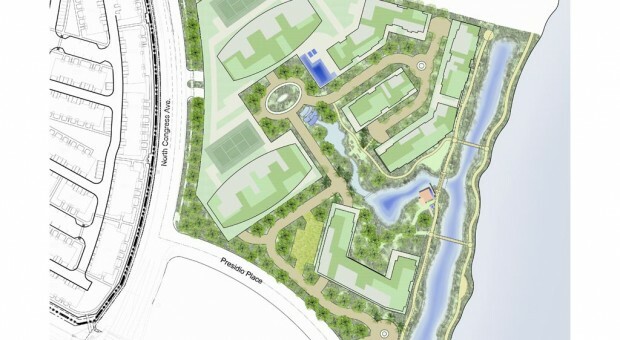 Rather than planning units and building footprints first, the overall site plan evolved directly from the site analysis including solar access, drainage and water quality, resident and public access to the waterfront, circulation, dominant wind directions, view sheds and ecological regeneration through the creation of new open spaces. The internal core of the site is composed around a central vista and watershed facing to the southeast which is also optimal for maximizing passive ventilation and cooling as well as solar orientation for potential energy generation. The core is then surrounded by lush corridors of vegetation and bioswales that feed into the core and create access to the central spine and the waterfront. In all of the plans developed over 95% of the parking is tucked under buildings and over 70% of the roof areas are vegetated. Unlike other planned green developments, this project included enough density to both cover the costs of the environmental enhancements as well as support a large proportion of workforce housing. A range of densities was planned including town houses, lofts, low-rises, 6-8 story mid rise buildings up to a 20 story tower. This project, like the majority of new Florida residential developments, has been on hold since 2008 due to the economic downturn.